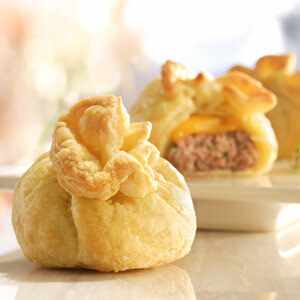 Petite burgers get jazzed up with melted cheese and puff pastry to create an appetizer everyone will adore. Vary the cheese and ground meat in a multitude of ways for ever-new, go-to hors d'oeuvres. Thoroughly mix the beef, steak sauce, seasoned salt, black pepper and green onions in a medium bowl. Shape the beef mixture firmly into 12 (2-inch) patties. Cook the patties in a 12-inch skillet over medium-high heat for 10 minutes or until they're well browned on both sides. Remove the patties from the skillet and let them cool to room temperature. Heat the oven to 350°F. Lightly grease or line a baking sheet with parchment paper. Sprinkle the work surface with flour. Unfold 1 pastry sheet on the floured surface. Roll the pastry sheet into a 10-inch square. Cut the pastry sheet into 6 (about 3 x 5-inch) rectangles. Repeat with the remaining pastry sheet to make 12 rectangles in all. 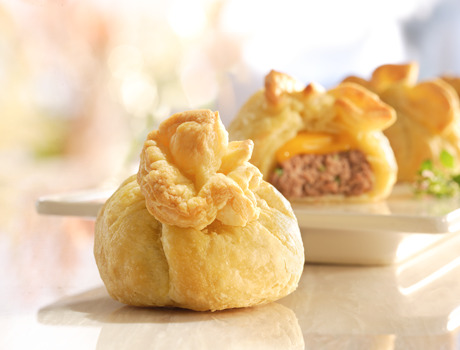 Place 1 patty onto the center of each pastry rectangle and top each with 1 cheese slice. Fold the corners of the pastries up over the filling and twist the corners to seal. Place the pastries onto the prepared baking sheet. Bake for 20 minutes or until the pastries are golden brown. Make-Ahead: The assembled bundles can be prepared up to 1 day in advance. Cover and refrigerate until ready to bake. If any cracks form while you’re working with Puff Pastry, just rub with a little water and press to seal the dough together.